Closeout! - The Surya Valentino Collection is hand crafted with 100% wool - felted, in India. 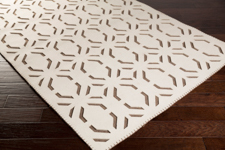 These rugs feature hand stitching, a medium pile/no pile, and a felt backing.